Enter through the ACWRA. Call in entries to Cameron at 870-613-5103. Limited to 100 teams. 2 teams per heat. 90 second limit each heat. 40 foot score. Contestants must have both feet on the ground at gunfire start. Event will be on 4/26 at 1pm on the racetrack. Click here to enter online! 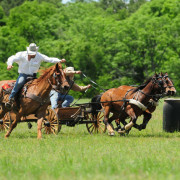 Takes place on racetrack during wagon race performances on 4/27 and 4/28. 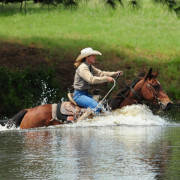 Alamo Horse Race is a ¾ mile track. Both feet must be on the ground at gunfire start. $60 Entry Fee. Takes place April 26th @ 7pm in the arena. $40 entry fee. Exhibition runs beginning at 5pm for $5/run. Takes place April 27th @ 7pm in the arena. Limited to 25 entries. 4 stages. $70 Entry fee. 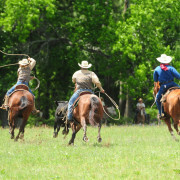 All contestants must have Western attire and Western hat. No short sleeves, t-shirts, or ball caps. Call in or text entries to Moon Swanson at 903-721-9111.